November 15, 2010 - On October 19, 2010, Air Canada announced that passengers on Jazz and Air Canada flights would now be allowed to use their cell phones during the taxi-in to gate phase of their flights. MPB’s Electronics Test Centre in Kanata, Ontario, played a significant role in this development. They were contacted in August 2010 by Air Canada with the request to carry out the testing procedures to verify that the aircraft systems would not be affected by the use of multiple handheld devices. First class anyone? Preparations for TPEDs testing on an Air Canada plane in Vancouver. Five Air Canada and four Jazz aircrafts of various models were assessed over a one and a half week period. Tests ran an average of 5 hours per aircraft, and were carried out at night when the they were not in use in Toronto, Ottawa, and Vancouver. 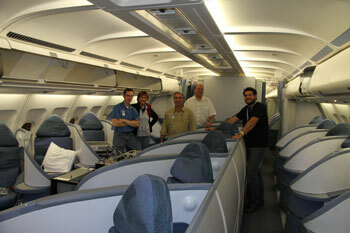 Air Canada provided the testing procedures, with technical input from the ETC Technical Team. A member of Transport Canada was present for part of the test on each plane to verify methodologies. The Electronics Test Centre carried out similar tests for West Jet two years ago. The Electronics Test Centre began as a modest EMI EMC and Electromagnetic laboratory in the early 1990s, and now caters to the Automotive, Aeronautical, Defense, Military and Commercial markets. ETC's specialists are committed to customer service and quality assurance. They support industry efforts to market electronic products by providing complete testing, evaluation, engineering, and documentation services.